What is Oracle Endeca Information discovery Tool - Oracle Endeca Information Discovery is an enterprise data discovery platform for advanced, yet intuitive, exploration and analysis of complex and varied data. analysis via interactive and configurable applications. Oracle Endeca Information Discovery enables an iterative "model-as-you-go" approach that frees IT from the burdens of traditional data modeling and supports the broad exploration and analysis needs of business users. Integrator Designer -Integrator Designer provides an easy-to-use interface you can use to create graphs for loading and updating your data quickly. A graph is essentially a pipeline of components that processes the data. Integrator Server -Information Discovery Integrator Server provides a runtime environment for the graphs.Integrator Server is not required in order to load data into the Endeca data domains. In other words, you can run Integrator Designer independently, and it does not require Integrator Server to do its work.You use Integrator Server only if you are running graphs in an enterprise-wide environment. 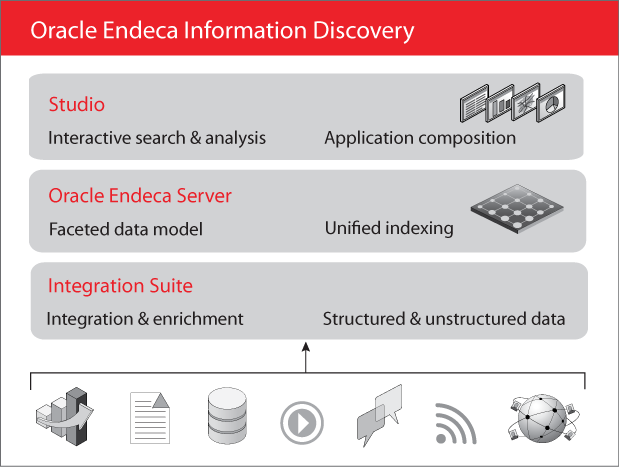 Oracle Endeca Information Discovery Studio is a web-based enterprise data discovery platform for advanced, yet intuitive, exploration and analysis of complex and varied data. Studio enables an iterative "model-as-you-go" approach that frees IT from the burdens of traditional data modeling and supports the broad exploration and analysis needs of business users. Studio includes the Provisioning Service, which allows business analysts to create Studio applications by uploading their own data directly from spreadsheets. Oracle Endeca Server is the core search-analytical database. It organizes complex and varied data from disparate source systems into a faceted data model that is extremely flexible and reduces the need for upfront data modeling. This highly-scalable server enables users to explore data in an unconstrained and impromptu manner and to rapidly address new questions that inevitably follow every new insight. Stay tune for more information on Oracle Endeca Information Discovery.